Splash pages, you gotta love 'em. A blank canvas where the artist can hit you with a large dose of illustrated 'wow'. This week, it's the mechanical marvel that is Iron Man vs the mythological might of Thor, rendered by the guy that would forever change the look of the Asgardian Thunder God, Olivier Copiel. "The application Iron Man Armour has unexpectedly quit/pooped itself. To send a report to Stark Industries click 'send'." 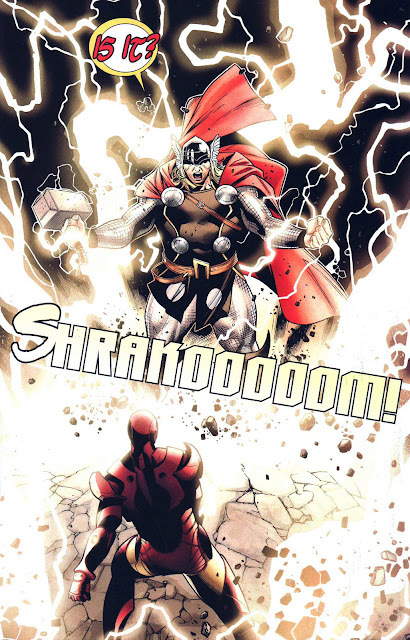 One of the best things Copiel established in his run, was the scale of Thor. Here as he gives the at the time head of S.H.E.I.L.D. Iron Man reason to rethink his ways, he actually has the imposing size of a God to back it up! Personally, while they'd fight side by side until the end, I've never thought the perspectives of Thor and a man who became a 'God' through science would ever see eye to eye. The way Copiel delivered the inevitable moment where the fiction exploded, is almost as wall-print worthy as the cover to Thor #3 itself. That was a great issue! Thor was rightfully mad at Iron Man. Iron man was licking his wounds... Lots of fireworks... All the right ingredients to an enjoyable readding. It sure was wasn't it Aliera! So much to love about that run on Thor it's just crazy. 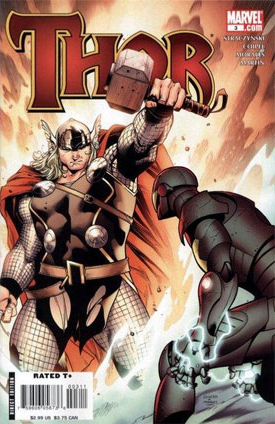 And to think I almost didn't get it because I'm such a fan of the original Kirby looking Thor!